One Thursday afternoon in between rain showers, I spent two hours with Geof, and it became plain to see why he is so enchanted with honeybees. Bloomfield Bees has hives scattered around Sonoma and Marin counties, in fifteen different locations. It is a mutual exchange, the bees pollinating local farms and crops, Bloomfield Bees harvesting the honey. As we talked, Geof was in the final stages of preparing a few hives to go out to a local gardener and farmer. 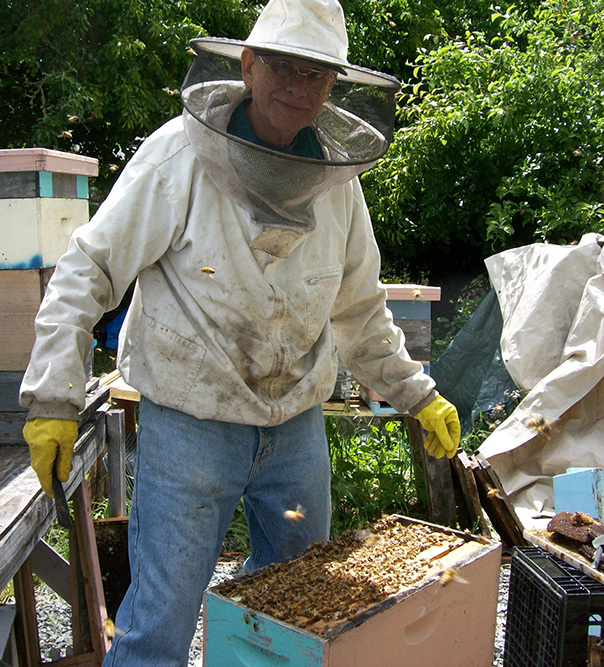 We donned bee suits and Geof gently and carefully moved the frames from one hive into another, talking to the “girls” as they buzzed about. They very quickly began settling into their new home once it was in place. I learned that new bees who are learning to fly will orient themselves by hovering around their hive and venturing out a little bit further each day, memorizing the hive’s location. Geof pointed out that temperature is a very important determinant in how much and how far the bees fly. The inside of a hive is between 95 and 100 degrees. If it is below 60-65 degrees outside, it is too cold for them, unless the sun comes out to warm them; we saw evidence of this as we watched the bee activity ebb and flow as the clouds and sun took turns in the sky. After looking into the hives, checking out the “bee tree” (a rescued oak limb with a vibrant and diverse bee population), seeing the honey extraction equipment, tasting fresh pollen from the hive (like spongy-sweet drops of sunshine), and examining propolis (a caulk-like substance that is antibiotic, antiseptic and antifungal), I finally got my sweet reward and sampled eight different kinds of honey, including the best-selling Sonoma County wildflower. I must say, my favorite was the lavender honey, a dark, rich grainy honey with hints of lavender floating through. Geof always keeps a few empty hives with four or five frames in them, called “trap hives,” in case a local hive swarms and needs a place to settle. He likens it to a traveler choosing a well-lit bed and breakfast over sleeping in the woods. Once the hive chooses to stay, he carefully tends it, helping it to grow stronger and thrive. With beekeepers like Geof, eager to share his knowledge and passion about bees, the future for honeybees, and for us, does not look so dim.